Minimum players for a full volleyball team is 15. Our major contribution to the city of Baltimore is our free sport leagues. 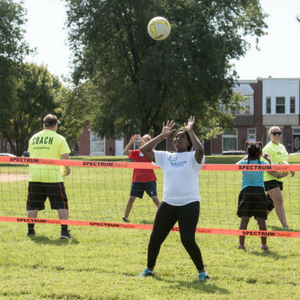 This season, we partnered with Patterson Park Preparatory School, a charter school in Canton. Our after school programming is free to all who register and is a great way to learn the basics of a new sport! 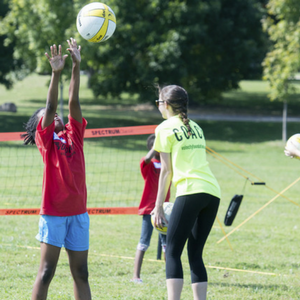 During our volleyball program, we used a variety of drills to teach our participants proper a volleyball stance, as well as how to bump, set, hit and serve. After the drills, the children have a chance to practice their newly learned skills during a real game! 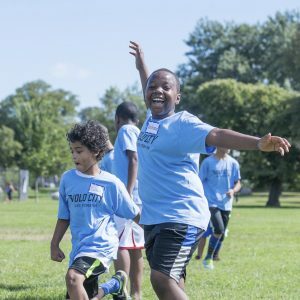 Each children receives a free Volo City Kids t-shirt, designating their team for end of day play. 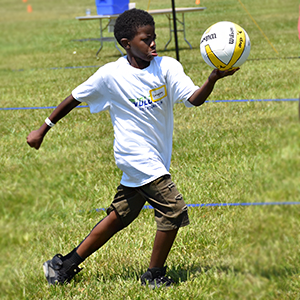 With encouragement from volunteers and fellow players, each child has the chance to learn a new sport, make new friends and experience the feeling of being on a team! Prizes. This is a SOCIAL league so make sure to bring your team and family to the after party!